It’s that time of the month again. When the monthly Top 3 Fans of Art and Decors are declared. These are people who have shown us so much love by being a part of the A&D Facebook family. From liking our page posts and pictures to sharing their views with us, they have helped us constantly learn and smile knowing that we are doing some things right that makes them happy. Ms. Rima Arora (India)- our TOP fan who’s won for the 2nd consecutive month! Apart from the bragging rights and the feeling of being so loved, these super fans also win a gift voucher worth Rs. 400 absolutely FREE! Art and Decors is India’s first curated e-commerce brand for design oriented luxurious and affordable fine art, fashionable decors and diamond, gold and fashion jewelry. Customers from all over the world can browse & buy from hundreds of curated design inspirations. The “A&D Shining Stars” Program is an innovative customer connect program exclusively for Art and Decors Facebook fans. The program seeks to reward engaged fans on A&D’s official Facebook page. Simple activities like liking a post, commenting on a post or posting relevant content let’s fans rack up valuable points and at the end of the month 3 top fans are declared as the “A&D Shining Stars” and win a gift voucher worth Rs. 400 absolutely FREE. So if you are interested in sharing love and winning free money for it, then head over to our FB page and start liking a post, commenting on a post or posting relevant content. See you there! Announcing our First Ever “Happy Santa Sale”! “Tis the season to be merry and have fun. And Art and Decors (www.artanddecors.com) is making sure that you have loads of it! A Massive 25% Off it with our first ever “Happy Santa Sale“! Enjoy shopping for affordable luxurious items across a wide range of gorgeous products. You can buy online stunning paintings on fine Italian canvas, fragrant candles that will help you relax and rejuvenate after a hard day’s work, soft and comfortable cotton bed sheets that will rest your tired body and mesmerizing chic home decor products like designer cushion covers and vases & the world famous Murano glass centrepieces! And all of this while you enjoy a massive 25% off all from the comfort of your home! Santa’s going to be happy only till the 31st of December, 2012. So hurry up and immerse yourself into blissful retail therapy on your favorite online shopping site Art and Decors! Use code ‘Xmas25‘ during checkout to avail this offer! Christmas shopping offer on Art and Decors.com. Enjoy a massive 25% Off! Art and Decors Launches Black Friday Special Sales! For all our loving customers out there in the US and Canada, we have something very special for you! We have launched our first ever Black Friday special offer. Now enjoy a massive 15% Off on the entire range of our fantastic products and we will ship your orders within 36 hours! Even better the offer is valid from 23rd November till 26th November! Use code BF15 when you check out to claim your offer. Art and Decors is committed to bringing the finest paintings from across the world for the art connoisseurs. 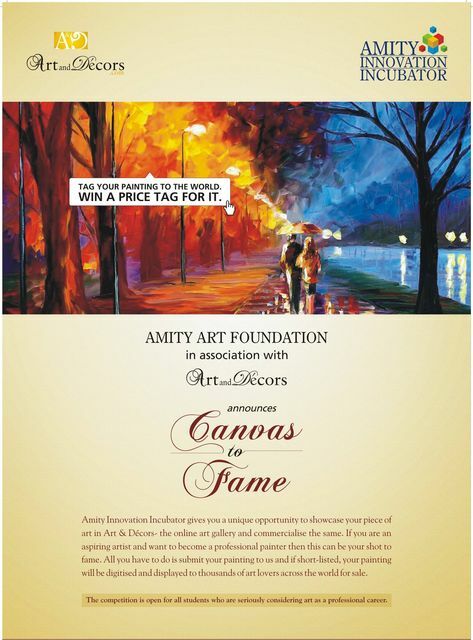 As a testimony to this commitment, Art and Decors is excited to launch ‘Canvas to Fame‘ program in partnership with Amity Innovation Incubator and the prestigious Amity Art Foundation. The program is aimed at providing a platform to upcoming young artists. So who will be the next Picasso or Van Gogh of India! Guess we will have to wait and watch! The chosen ones will get an opportunity to showcase their paintings on Art and Decors.com, India’s most innovative online art shopping site. Intricate work of sticking precious Swarovski crystals on to a cushion cover. Swarovski cushion covers available only on Art and Decors.